On the 30th October Shaun, Kevin and I were ringing at Durlston. By this time of the year trans-Saharan migrants have largely departed and visible migration of finches, thrushes, Woodpigeons and Starlings predominate. There was a strong movement of Linnets and Starlings, plus a few thrushes, Bramblings and other finches overhead. We caught 31 birds, a mixture of thrushes, Goldcrests plus a few Chiffs and Blackcaps. By far the best bird of the day was the Bee-eater that I had seen the day before in Swanage. Originally relocated by Hamish Murray and Nick Hopper near the Globe, it flew straight over the ringing site and even perched close to the nets (but not close enough) before flying off north. 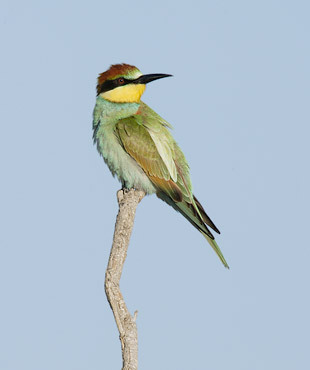 I seldom take my SLR camera with me when ringing, but here is a photo taken from the internet which is very like the view we had of the immature Bee-eater. The three of us reconvened at Lytchett Bay in the evening to ring Pied Wagtails. Our last outing for wagtails had been rather busy, but this time we trapped a more manageable 61 birds. The net ride we use for wagtails is a real mud bath and taking the gear down and getting the birds back to the car in the dark was a bit of a challenge. Putting the clocks back really inhibits our wagtail ringing, as few of us are free mid afternoon to set up, and it really needs two people to do so. This might prove to be our last attempt this year. The smartest bird of the catch, an adult male Pied Wagtail. After a couple of wet and windy days at home I headed to Devon on the 2nd November. I had two targets for my year list, both American birds. The first was a Bonaparte’s Gull at Dawlish Warren which I may have seen in the distance but never got a conclusive view. The tide was dropping on the Exe estuary and many wading birds were on the move, but small gulls were in short supply. The Bonaparte’s Gull had spent the previous few days on or near these groynes. Exmouth, on the east shore of the Exe is in the distance. Once it was clear that I wasn’t going to see this bird I headed down to Plymouth to look for a Lesser Yellowlegs, an American wader related to our Redshank and Greenshank. The creek where it has taken up residence is in Ernesettle, an estate that borders that Tamar River (which forms the border between Devon and Cornwall). remarkably I know this area as when Janis and Andy lived in Plymouth we used to visit Andy’s mother Joan, who lived just a couple of streets away from the location of the bird. Joan passed away in 2009 and the last time I visited this area was for her funeral. I arrived early afternoon at Ernesettle Creek but the tide was fully out and all the birds were hiding in the creeks. 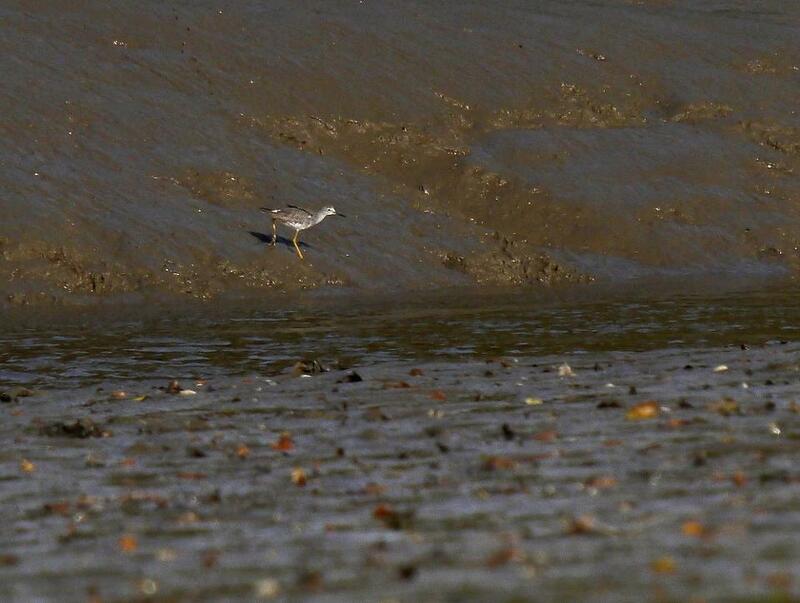 I had to wait until it was almost dark before the tide had risen enough to push the Yellowlegs out of the deep creeks. By then it was too dark for photos so I have taken a picture of the same bird by Tom Whiley from the internet. I was quite late getting home on the 2nd but I was up early again on the 3rd for another ringing attempt at Durlston. There was heavy rain just before dawn and we had to wait in the car for 30 minutes before we could set up. The day was cold, windy but remarkably clear and there was a large movement of finches and Woodpigeons. We had only caught 11 birds by 0900 so we decided to pack up and go and have a look in a sheltered corner of the park called Caravan Terrace. Here we found four Firecrests and a couple of Chiffchaffs. After the rain it was crystal clear, Pervril Point, Old Harry and the Bournemouth seafront 15km away are clearly visible in this photo and through binoculars we could see the lighthouse at St Catherine’s Point on the IOW, a full 46 km away. Sundays trip to the New Forest is the subject of another post. On Monday 5th Mick and I returned to Durlston, the wind was northerly so we ringed at the ‘Goat Plots’ but only trapped 15 new bird plus a few retraps. However we did catch three Firecrests a bird that has become much commoner in recent years. A male Firecrest with its orange crown stripe. UKs smallest birds a Firecrest and a Goldcrest. The birds are the same size, the Goldcrest was held a little further from the camera. On the 6th Mick was busy and rather than try Durlston on my own I did some ringing at Paul Morten’s garden in nearby Lytchett Matravers. We ringed some 22 birds, mainly Goldfinches. As so often happens the local councils have opted to do all the road repairs in November and several roads near us are closed. As expected there is traffic chaos and this is likely to continue into December. « October 31st – Halloween and some family news.